On Thursday’s CBS "Early Show," co-host Maggie Rodriguez teased an upcoming segment on John McCain’s latest ad criticizing Barack Obama declaring: "War of words...The race for the White House gets ugly as John McCain and Barack Obama spar over negative ads." When Rodriguez later introduced the segment, she specified who was "getting ugly": "The race for the White House has officially turned negative with the McCain campaign drawing first blood and Barack Obama responding quickly." On Monday, co-host Russ Mitchell declared that another McCain ad showed that the "gloves are off" and was a sign of how "nasty" the campaign was getting. Thursday’s segment began with a report by correspondent Chip Reid, who decried the negative turn: "You know, it's more than three months before election day and the McCain campaign has already decided to go negative. Recently they've released a series of attack ads and the latest one compares Barack Obama to pop stars Britney Spears and Paris Hilton." Reid then described the Obama response: "The Obama campaign rushed out a response ad," a clip of the ad was played: "John McCain. His attacks on Barack Obama not true, false, baloney, the low road." Reid then proclaimed that: "Campaigning in Missouri, Obama took the high road." Reid then described how the ad would probably backfire on McCain: "Political analyst David Mark says the ad is sure to get a lot of attention as it's replayed again and again on the internet and cable news. But he says it could well turn out to be a mistake." Mark, from politico.com, then commented: " McCain's campaign is predicated on the notions of honor, being upright. This seems a little bit beneath him." Reid concluded his report by wondering: "And one big question for Obama now is how long can he continue to take the high road with McCain increasingly on the attack?" ...will people believe this? I mean this is kind of a stretch, to say Barack Obama has something in common with Paris Hilton, and you have to wonder if people are going to buy that. I tell you, the other part of it is, it's very surprising, this is very unlike John McCain and the kind of campaign he said he was going to run. So maybe they will be able to define Barack Obama in their terms, but on the other hand, I think there's a high possibility that all this could blow up in their face and backfire. Rodriguez then asked: "Do you think it's inevitable that Barack Obama will eventually go down the same road? And if so, what is it about John McCain that he would attack?" To his credit, Schieffer mentioned some of the Obama campaign’s attacks on McCain: "Well, I mean, they've already tried this, there's no question about that. Look, when Wesley Clark, who was speaking for Obama, tried to marginalize John McCain's military service...So both sides are engaging in this. I don't think the public likes it, but I think we're going to see more of it." While Schieffer condemned negative attacks, on Sunday’s "Face the Nation" he compared President Bush to "the Queen of Hearts in Alice in Wonderland." Following the same theme of Rodriguez wondering if the ad was a "sign of desperation" of the McCain campaign, Schieffer observed: "One thing for sure, when you're running ahead you don't normally run negative ads about your opponent. I think this does say that John McCain's people know that he's behind right now." Rodriguez concluded the segment by turning to Democratic Party unity: "I want to ask you in the last seconds Bob, about the news that we just got that Hillary Clinton will be speaking on the second night of the Democratic convention with all female senators behind her. That's going to be her night. That's going to be quite a statement." Schieffer agreed: "Well, it certainly is...it'll be quite a night." MAGGIE RODRIGUEZ: War of words. UNIDENTIFIED WOMAN: He's the biggest celebrity in the world. But, is he ready to lead? BARACK OBAMA: He doesn't seem to have anything very positive to say about himself, does he? He doesn't -- he seems to only be talking about me. You need to ask John McCain what he's for, not just what he's against. RODRIGUEZ: The race for the White House gets ugly as John McCain and Barack Obama spar over negative ads. MAGGIE RODRIGUEZ: But first this morning, nothing happy about some new campaign ads. The race for the White House has officially turned negative with the McCain campaign drawing first blood and Barack Obama responding quickly. 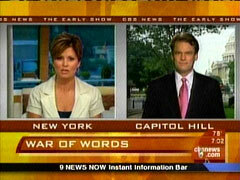 CBS News Capitol Hill correspondent Chip Reid is in Washington. Good morning, Chip. CHIP REID: Well, good morning, Maggie. You know, it's more than three months before election day and the McCain campaign has already decided to go negative. Recently they've released a series of attack ads and the latest one compares Barack Obama to pop stars Britney Spears and Paris Hilton. REID: So what exactly are Britney Spears and Paris Hilton doing in a presidential campaign ad? Well, the McCain campaign says it's to suggest that Barack Obama is more interested in building a reputation as an international celebrity than in running a traditional campaign for president. McCain advisers note that Obama's adoring fans follow him everywhere he goes, even in Germany, where more than 200,000 showed up last week to hear him speak. RICK DAVIS: The focus on events and activities is much more something you would expect from someone releasing a new movie than running for president. REID: The Obama campaign rushed out a response ad. UNIDENTIFIED WOMAN B: John McCain. His attacks on Barack Obama not true, false, baloney, the low road. REID: Campaigning in Missouri, Obama took the high road. OBAMA: You know, I don't pay attention to John McCain's ads. Although I do notice that he doesn't seem to have anything very positive to say about himself, does he? He doesn't -- he seems to only to be talking about me. You need to ask John McCain what he's for, not just what he's against. REID: Political analyst David Mark says the ad is sure to get a lot of attention as it's replayed again and again on the internet and cable news. But he says it could well turn out to be a mistake. DAVID MARK: I think this has a big potential to backfire. McCain's campaign is predicated on the notions of honor, being upright. This seems a little bit beneath him. REID: And one big question for Obama now is how long can he continue to take the high road with McCain increasingly on the attack? Maggie. RODRIGUEZ: CBS's Chip Reid, thank you Chip. Joining us now, CBS News chief Washington correspondent and host of 'Face the Nation,' our friend Bob Schieffer. Good morning Bob. RODRIGUEZ: So what do you think about these McCain ads? Is it a sign of desperation or is it normal? SCHIEFFER: Well, it's certainly a sign that they've changed strategy. They brought aboard a new strategist, Steve Schmidt, about a month ago. He was from the old Bush campaign team and he's bringing in some of the techniques that the Bush people used against John Kerry. They have concluded that while Barack Obama is famous, that a lot of people really don't know him. So what they're trying to do is define him and tell people who he is in their version. Now, the question is, is this going to work? They're trying to picture him as an elitist, as someone's who's aloof, who's sort of divorced from regular life. They're aiming this at those white, blue collar Democrats who voted for Hillary Clinton didn't vote for Barack Obama in the primaries. They're saying 'this is really not your kind of guy.' The question, though, Maggie, is will people believe this? I mean this is kind of a stretch, to say Barack Obama has something in common with Paris Hilton, and you have to wonder if people are going to buy that. I tell you, the other part of it is, it's very surprising, this is very unlike John McCain and the kind of campaign he said he was going to run. So maybe they will be able to define Barack Obama in their terms, but on the other hand, I think there's a high possibility that all this could blow up in their face and backfire. RODRIGUEZ: Do you think it's inevitable that Barack Obama will eventually go down the same road? And if so, what is it about John McCain that he would attack? SCHIEFFER: Well, I mean, they've already tried this, there's no question about that. Look, when Wesley Clark, who was speaking for Obama, tried to marginalize John McCain's military service, and said -- I asked him on 'Face the Nation,' why, you know, that he thought McCain shouldn't consider, you know, his military service shouldn't be considered as something that was a plus for somebody running for president. And he said, 'well, you know, just being shot down over Hanoi does not qualify you for being president.' So both sides are engaging in this. I don't think the public likes it, but I think we're going to see more of it. One thing for sure, when you're running ahead you don't normally run negative ads about your opponent. I think this does say that John McCain's people know that he's behind right now. RODRIGUEZ: I want to ask you in the last seconds Bob, about the news that we just got that Hillary Clinton will be speaking on the second night of the Democratic convention with all female senators behind her. That's going to be her night. That's going to be quite a statement. SCHIEFFER: Well, it certainly is. And I guess that this also tells you, Maggie, that she is not going to be on the ticket with Barack Obama, because if she were she would speak the night after that, when the running mate traditionally runs. So it'll be quite a night. But I think this tells you what a lot of people have been saying that she is not the one that Barack Obama's going to pick to be on the ticket with her. RODRIGUEZ: Bob Schieffer, thank you so much Bob.